Phil Jones has been at the root of Manchester United’s defensive solidarity this season, and we dive into what he’s done right and how he’s helped them to the best defensive showing in the league. Jose Mourinho’s teams operate with a particular template. His back 4 has one attacking Full Back, and one defensive Wing Back and his centre halves generally involve a pairing with one brisk, muscular and impulsive Centre Back and another ball playing, assured one. He would have loved Vidic and Ferdinand. This season, when he signed Victor Lindelof from Benfica, everyone assumed that he would be the ball playing Centre Half, sitting besides Eric Bailly. But mistakes in pre season and in the Super Cup meant Phil Jones was given a chance to play along side the Ivorian. 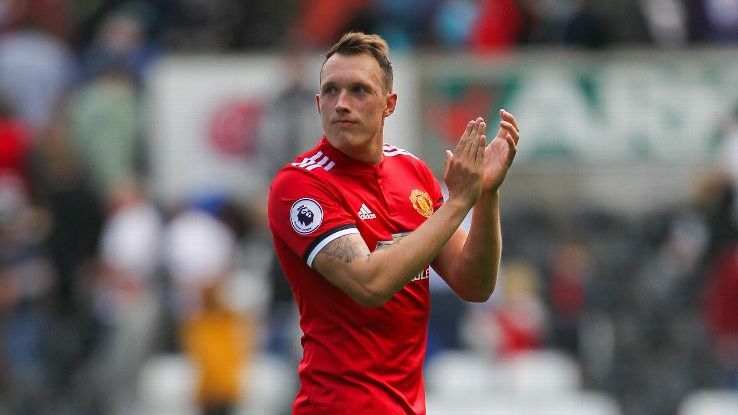 Man United have conceded a goal every 370 minutes with Jones as opposed to one every 34 minutes without him. As soon as Jones was subbed off through injury against the Terriers, Manchester United conceded twice in quick succession, both goals stemming from personal errors. The talent has always been there and he has been likened to a young Duncan Edwards at times. But his main issue has been injuries. 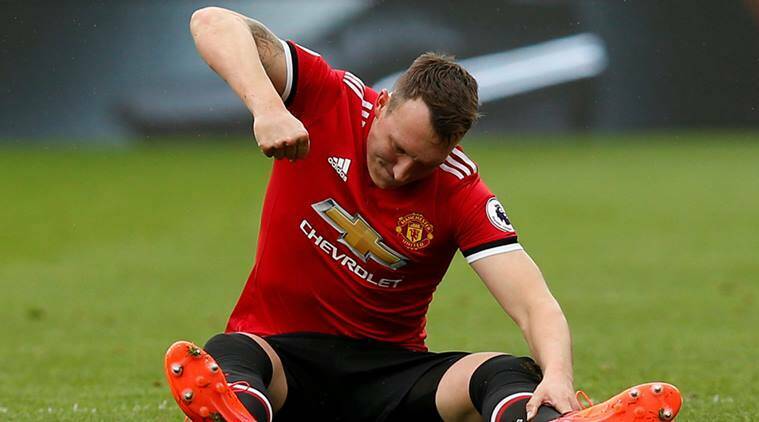 This season, Jones has shown grit and determination to stay fit and even when he was rumoured to be suffering from a knock at Palace and before Spurs, he’s put it aside and got on with it. In addition to reducing the number of injuries, Jones has also taken real command of his box. Along with Bailly or Smalling, Manchester United have not conceded at home this season. A very clear sign of a solid organised defense. United on the whole, have conceded only one goal from set plays this season, showing how much of an impact Jones has had on his mates at the back. Tactically, Phil Jones has done exactly what’s been asked of him. He is no longer on corners, thankfully. But barring that Jones has added a no non nonsense approach to his game, and doesn’t hesitate putting the ball out of play as opposed to playing out from the back. Phil Jones in comparison to other leading Premier League Centre Backs this year. Note: No Chelsea defenders were picked as no Centre Back has played in that position for 10 games and Joel Matip from Liverpool isn’t on the list because of the number of goals Liverpool have conceded at the back. 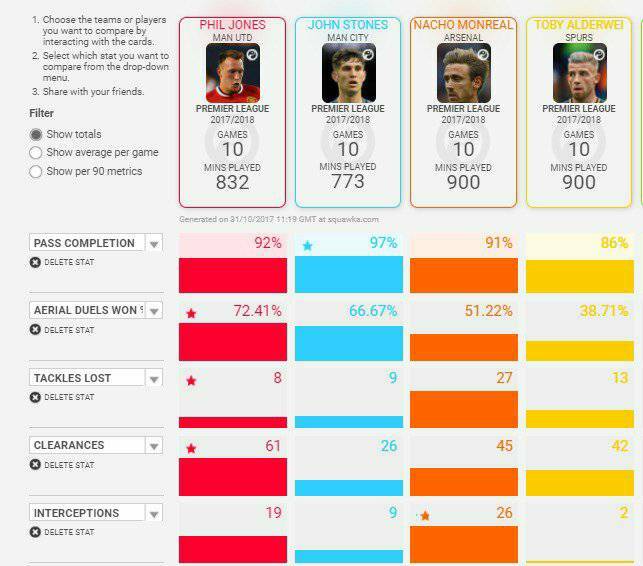 When compared to the rest of the division’s similar Centre Backs, Jones is second on passing success %, only behind Guardiola’s Stones. He’s won the most number of aerial duels by a mile and when he commits a tackle, he seldom loses. Mourinho has asked him to adopt a more “old-school defender role” where he is encouraged to put the ball out, resulting in more number of clearances. He is also second for interceptions, making several more than Alderweireld and Stones as he is cutting out passes through his defence a lot more due to the high line. Phil Jones would appear to have amongst the best ball retention ability in this United side and is very good at recycling the ball as well as playing it into the feet of attackers further forward. Another thing about Phil Jones is his concentration through the 90 minutes and he has seldom been caught out this season for over committing or being out of position. However the most telling fact or statistic would be the number of goals conceded, Jones has conceded only 2 goals this season, away at Stoke, much lesser than any defender of any side in the Premier league this season. As per Squawka’s evaluation process Jones also has the highest defence score(353.07), more than Alderweireld(148.1) and Stones(142.4) combined. He was at the top of his game on Saturday , as United recorded an important victory over Title Rivals Tottenham. His partnership with Smalling and Bailly hardly gave the opponents a clear sniff at goal. Phil Jones’ credentials face their biggest threat as he travels away to the bridge on Sunday in what could be a monumental clash in the race for the Top4 and the title. If Mourinho and his men are to win or get something out of it, Jones is going to have to be on his A game. Visit arsedevils for more updates on Manchester United. The post Phil Jones : The Resurgence appeared first on El Arte Del Futbol.